In this (and probably other) queries, there is a sum at the bottom. What does the "496" sum at the bottom mean? I'm a bit puzzled as it's not the tally of bounties or users who have scored them. What is the explanation? As mentioned in a comment by mat it will just be posts without a null owneruserid. It's part of a subselect in the query so the main count will still be returned while leaving the name and location blank. That occurs when an account has been deleted or the user has requested to be disassociated with the post as part of the anonymization process, although the latter is probably a bit more unlikely with answers that have been awarded a bounty. 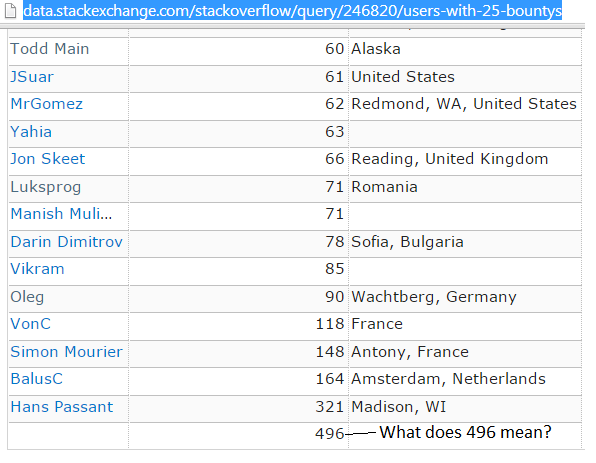 What is the median reputation level on Stack Overflow? What does it mean to commit to a documentation proposal? What does the score in the tag mean? What does the profile text “a laser-like focus on one topic” indicate?